Gucci is adding new unisex timepieces to its distinctive Le Marché des Merveilles collection. 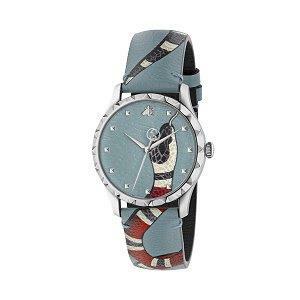 The line uses animalier motifs and bright colors as key design elements, both the dial and strap of each watch are crafted from the same material: pastel cobalt, pastel green, or pink leather. 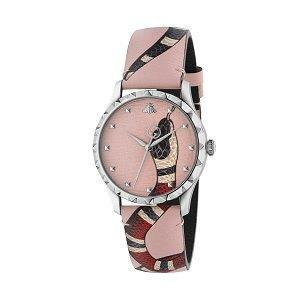 The Kingsnake, a signature motif of the House, wraps around the strap and continues onto the dial. The bee, another recurring code, is also present as an index at 12 o’clock. Other notable details include the studded bezel, the bee engraving on the 38mm steel case back, and the second hand with the interlocking G motif. The new pieces inject an extra dose of color into the Le Marché des Merveilles timepiece collection, which already includes a black version of this watch. 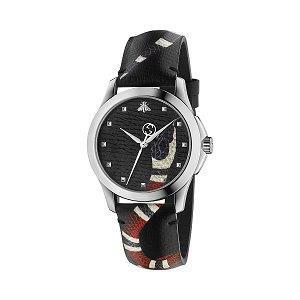 The watches are water resistant to 50m and feature a quartz movement.